I ogled this tee at the LOFT the entire time it was in stock. After it sold out, I decided I would try my hand at making something similar. 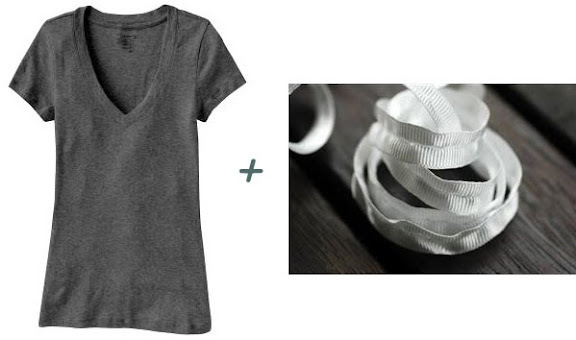 I took a simple grey tee I had laying around, and added a a ribbon embellishment in the vine pattern. I pinned the crap out of it, and sewed a straight stitch down the center of the ribbon. It took a few hours, but was more tedious than difficult. What do you guys think? Anything you are craving to make this week? Leave a comment! I say GREAT JOB ! I like yours better - not so busy ! Very cool! Did you add white ribbon to the neckline too or is that another shirt underneath? I love the way it turned out! Great job! whoa you did such a great job! it looks amazing. You are brilliant!!! That is gorgeous!! Very cool. Would also be fun tone-on-tone. Wow!! Yes, I LOVE the Loft shirt, but I can totally do that! I'm going ot give it a try! Beautiful. You did such an awesome job! It looks great! That looks lovely! You did such a great job. You could seriously sell embellished tees on etsy or something! Great tee! I love what you did! I have a giant pile of clothes that need to be refashioned/tailored that I've been meaning to take care of. Two shirts down, 4 more to go! I agree with the others, I like yours better! Great job! Great job!! Wow, I like your much better! That turned out so great!!! You're amazing, Madeline! jean paul gautier once said that when you have so few supplies (and no money) you MUST be very creative to achieve the result that you want! You are really an example of creativity! Yours turned out even cuter that the original. I wish I lived close so you could help me make one. There's now way I could do that by myself! I so like it! The plain blouse just transformed into an elegant one.. :) Cool! Yours is so much better than the Loft one!!! Fabulous!!! FABULOUS job! I like yours even better than the LOFT tee! so did you just stitch some ribbon inside the v-neckline as well? Smart. The loopity loo seems to tricky for me, but I like the neckline idea. It is getting too hot in AZ to have to wear a million layers, I might add some ribbon to my tops that are too low cut to wear to work and forego the undertank.